On my tour through Ukraine a couple years ago I became familiar with what is known as the iconostasis (plural iconostases) that is found in almost every Eastern Orthodox Church. This is a thin wall or partition that separates the nave, where the lay worshipers reside, from the sanctuary in the church, where the priests prepare the sacraments at the altar. As one enters a church, the iconostasis is the most visual object, and center of focus, at the end of the nave. 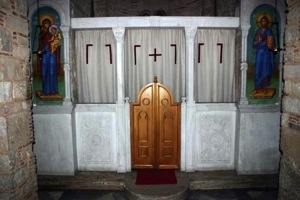 The iconostasis most likely evolved from the early chancel screen or templon, another form of the partition still used in Western churches, templon being from the Greek word meaning “temple,” deriving “from the Christian idea of the shrine where God was worshipped”1.